Is the process ripe for a 21st century revival? Modern minds have been rewired by technology such that some features of the pre-technology world are simply incomprehensible. I’m thinking now of the basic thermometer, which is knitted so tightly into our being that we can’t engage the outside world without making an involuntary assessment of the temperature. It’s hard to imagine a time when people would just shrug and say, “eh, it’s chilly.” That’s why it’s so hard to imagine the world of brewing before we’d invented the thermometer. Not only did the brewers of old not know the temperature of their mashes, but they weren’t even sure what role temperature played. I love to turn to an old book by the brewer and scientist Georges Lacambre from 1851, Traité Complet de la Fabrication des Bières, where he describes Belgian brewing of the time. Thermometers had been around nearly a hundred years by that then, and even still, the brewers did insanely convoluted mashes, often starting with cold water, to try to draw the sugars off the malt—a throwback to the time when they had to use these mashes to make sure they got enough fermentable sugars to make beer. (Mashing, I should note, is the process of soaking malted grain in warm water at temperatures that activate enzymes to convert starches into sugars; it creates a kind of malt tea called “wort” that is perfectly digestible to yeast.) Describing bière blanche de Louvain, Lacambre had to spend six paragraphs describing the mashing regime, which required five vessels as well as baskets and pans to strain and spoon out wort and “eight to ten strong brewers” to manage the ordeal. The Bavarians used a better system, but it was still something of an ordeal. And, unlike the five-vessel Leuven system, the Bavarian practice is still very much in existence. Known as “decoction mashing,” it’s an ingenious system that allowed the brewers to slowly raise the temperature of a mash so that all the available starches and proteins were converted to starches and amino acids—even without knowing how warm the mash was. The process goes like this. The brewer starts by infusing the beer with blood-temperature water. The brewer had to ballpark the starting temp, but it didn’t matter too much if he was off a few degrees. After a period of time, the brewer would take a portion of the mash—liquid and grain both—and move it to a separate vessel. This was called a decoction. Then he would slowly raise the temperature of the decoction until it was boiling. After boiling it a time, he would return it to the main vessel, and the temperature of the whole mash would rise. By repeating the decoction process twice more, the brewer managed to convert the starches fairly effectively, all without the use of a thermometer. It was especially effective with the malt they were using at the time, which was darker and not ideal for producing sugar-rich worts. There was an unintended benefit to this whole process. It created melanoidins—dark flavor compounds formed during the repeated boiling that produce a rich texture and deep color. Centuries later, the Bavarian method was imported by Bohemian breweries, and the effect on pale lagers was to give them a deep golden color and rich, smooth bodies—the qualities for which modern Czech pilsners (or světlý ležáks) are known. Another factor breweries have to consider is time and expense. The process of removing part of the mash to a separate vessel, raising the temperature, holding it, and then raising it to a boil, and finally returning it to the main vessel—all of this is far more time-consuming than just heating a single vessel as the mash progresses. The benefits gained by decoction mashing are, even proponents would admit, subtle. Are they worth it? When I was first writing about beer, I watched the late beer writer Michael Jackson taste the beers at a small brewery in Portland called Saxer. 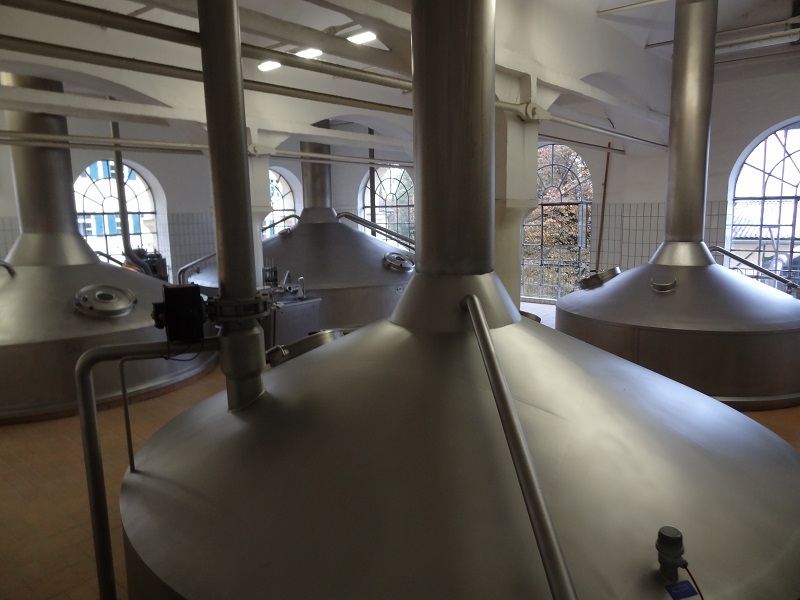 The brewery was devoted to lagers and the brewmaster, Tony Gomes, was a German-trained advocate of decoction. He’d convinced the owner to buy a decoction system and allow him to use it, even though in the early 1990s, Americans could barely tell the difference between an ale and a lager, never mind pick out melanoidins in a decocted bock. Jackson, however, could, and after sampling Saxer Bock, his first question to Gomes was, “You used decoction, yes?” Gomes beamed, happy in the knowledge that his method was evident to those in the know. But the owner may have been more prescient: Saxer ultimately went out of business. As more and more Americans start pursuing traditional European methods, decoction brewing is enjoying some resurgent advocacy. American palates are far more sensitive than they were 20 years ago. Is decoction mashing ripe for a 21st century revival? Time will tell. Meanwhile, go buy a bottle of Czechvar (Budvar’s American-label name) and an Ayinger Fest-Märzen and see if you can spot the decoction. That is cool, what i have found decoction greatly improves beer in several ways.I no longer use any specialty grains..
Am I completely off-base in wondering if an LME brew could have a similar net taste experience as a decoction brew? Gomes was a true brew magician. Pilsener of dreams. Even his Saxer 99 (3.5% little brother) far surpasses anything but maybe early days Live Oak pilsener. The von Trapp Brewery in Stowe, Vermont, uses decoction.